We love to hear Raving Testimonials! At LAMMSCAPES! we’re not satisfied until you are. It means so much to us to hear from our clients. Went to Lammscapes a week ago and we were so lucky to be greeted by Shirley. Within 1/2 hour she had talked to us and shown us choices for our new home landscape. We didn’t buy that day because we had been told to check out Minors and compare to Menard’s from friends and family members. We did compare. Menards did not have the selection nor customer service that Lammscapes did. We went to Minors. Spent an hour walking around and not once was asked by an employee to help us. We left and came back to Lammscapes . Shirley recognized us and greeted us. She then used her vast knowledge to help us pick up the perfect plants. There was also a young man Who helped pick the plants, load the truck and was extremely polite. I would totally recommend Lammscapes to family and friends for outstanding customer service, wonderful selection, quality plants and reasonable prices. We will be back!! And I hope her name was Shirley!! Had Lammscapes come yesterday to prune all of our trees in Cedarburg. Very happy with the work. They showed up on time and cleaned up when completed. I’ve been here over 10 years and never had my trees pruned. After John stopped by for the quote, he recommended that we prune and clean up all the ornamental trees and the rallmaining ones with a light touch. John was very courteous and professional. His team at Lammscapes is quite a nice bunch. I will recommend them in the future. I toured their place on Sherman Road this year. I suggest you check it out during the season to see all the neat things that they offer. I was impressed and can only imagine how neat it looks during the summer! Keep up the great customer service! Lammscapes is by far the best plant nursery ever! I would rate this 10 stars if I could! To top it off the people who work here are amazing! I love the scenery, I love Crystal Clear Cedar Creek! I love the woodsy parts, there even is an gorgeous gazebo for people to do photo shoots. In the fall they do hay rides that get pumpkins. Even crazier still the hay ride goes right through Cedar Creek! Lammscapes is a big huge blessing to anyone who loves plants and the outdoors! Great fun getting together with friends making Christmas decorations for our homes. We had a great time at the planter workshop yesterday. The staff is friendly and helpful. The best place ever! Everyone is so nice and the events are just Divine! I Love Pumpkins in the Pines!! I Love Cedar Creek! I love everything about Lammscapes and The Lamms. 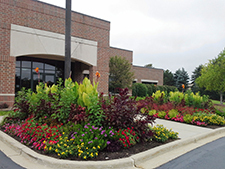 They recently did our landscaping and did an awesome job. Attended their Blue Grass festival on Sunday and really enjoyed it. Great venue and great customer service. Attended a wedding held on their property and it was gorgeous, wonderfully landscaped and it was a perfect setting for a summer wedding- it was a little on the warm side, just due to it being summer, but with the tent the wedding party had it made it comfortable. I love this garden center. They have the best customer service, and there workshops are so much fun and helpful. My containers that they help me plant are growing like never before. Thanks Lammscapes! Excellent customer service! I will definitely be back! Best Garden center ever!!! Happy employees, great service, and who guarantees their plants for life. Love Lammscapes ! The quality of work and customer service Lammscapes! 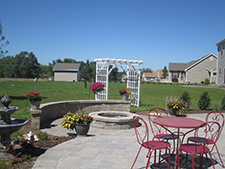 provides is outstanding and so impressive in all aspects of the annual landscaping maintenance program – they complete the work to the highest of standards. Without a doubt, we have the best maintained landscape/lawn in the neighborhood – the trees, shrubs and plants look amazing – what a great job trimming the shrubs and trees. Working with your crew (they took the time and effort to view every part of our landscape/lawn paying attention to details and came up with many excellent ideas and suggestions). They are very thorough and go the extra mile and were very patient with me. I just wanted to let you know that our property has never looked better. What an amazing job your crew does (very professional, hardworking and they show great pride in their work). Although I normally do all the flower beds myself, going forward I will definitely have them do all the design and planting. Very much forward to continuing our working relationship with them and highly recommend them to anyone. The girls who come to work on our property are absolutely wonderful! They are pleasant, knowledgable, HARD WORKING and do much more than would be required for “maintenance”. They are just great and I wanted to tell you so. Thanks again. You run a great family business! Thank you so much for the wonderful day your staff provided my friend and I at your garden center!! We had a beautiful day and excellent service!! I was also able to find some different things that are not prevalent in the big city!! Thanks again for having such a nice place to go!! I cannot tell you how much of a difference these plantings and the pruning, the beautiful mulch makes in my yard! Thank you! Your crew did an amazing job! Not only were they quick, they were very happy and you could tell they really love what they are doing! They picked up their debris as promised and they worked nonstop!! Oh the energy they had! Every single planting was of the highest quality and great thought was planned out as to where everything was to be placed! When your crew came to our house for the first time 7 years ago, we had a few pretty spots; now we have ALL pretty spots. 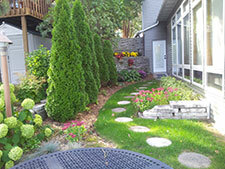 All of a sudden last week, I became aware that it is not just a couple beds that look nice – it is everywhere – foreground, background- perennials, woods – paths, shrubs, garden… The maintenance crews have been competent, hard-working, pleasant and friendly. But beyond great employees, we know what it takes to run a small family business; we respect your values and your commitment to service. You have created an absolutely wonderful place for us to be. 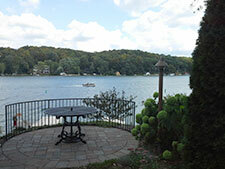 As we approach retirement age, it is a great joy to know we will get to spend our time here! Thanks!